Let’s face it: dogs age faster than we do, and it’s hard to watch them start to decline in health. Thankfully there are lots of ways to keep our older dogs happy and as healthy as possible as they age. Finding the best dog food for an older dog is a huge way to do that. Your older dog needs high-quality kibble for a healthy aging process. What Age Defines an Older Dog? To find out if your dog is considered geriatric, look to the life expectancy. For a larger breed like a German shepherd, the life expectancy is anywhere from 9-13 years. German shepherds start needing special diets to help them age more comfortably when they’re around 5-6 years old. Smaller dogs like Yorkshire terriers or Cavalier King Charles Spaniels tend to live anywhere from 11-16 years, so their older age begins at around 6-8 years old. When dogs get older, their metabolism slows down. They don’t run and play like they used to, so they need fewer calories in their food while still getting the nutrients they need. Obesity causes dogs to age faster and die younger, so you definitely want to give your older dog a food that meets their caloric needs but does not exceed them. Dogs also face various problems as they age: cancer, heart disease, kidney disease, cancer, diabetes, and arthritis are some examples. If your dog suffers from health complications, you’ll need to find food that’s rallies his immune system like nothing else. In the list below, you’ll discover our top 10 dog foods for older dogs. Some are from brands you probably know, and some you may never have heard of, but each of them is well worth looking into if you’ve got an older dog to care for. A tasty lamb and rice recipe that your senior dog will gobble up, Nutro Wholesome Essentials Senior dry dog food contains vet-approved amounts of glucosamine and chondroitin, which are essential to helping your pup age with less chronic joint and bone pain. While it’s a little pricier than other dog food options, Nutro has a stellar reputation and has been around for decades. This affordable yet high-quality kibble is packed with antioxidants to support your older dog’s immune system. Made with chicken meal, brown rice, and whole grains (which are actually good for your dog, contrary to popular opinion! ), this dog food has helped countless senior dogs live out their golden years in comfort. Also check out the Hill’s dry food that’s made especially for older small dogs. Just check out the reviews on Amazon. Dogs love this food and it really helps them feel their best. 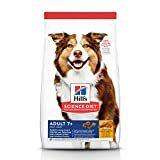 As a bonus, every time you purchase Hill’s Science Diet foods, you’re helping feed thousands of homeless pets. If your dog suffers from gassiness or you think your yard is consistently full of too much stool, Nature’s Recipe Senior Lamb Meal and Rice can help. This kibble contains oatmeal and barley to aid in your pup’s digestion, and it works: Consumers praise this food for helping relieve their older dogs’ excessive flatulence and stool elimination. This means that the food doesn’t irritate your older dog’s intestines, which is crucial to your dog’s happiness in her old age! While grain-free food isn’t necessary for every dog, some dogs do thrive in a grain-free diet. 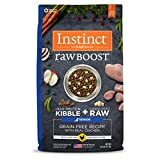 If you’re looking for a quality grain-free food for your older dog, look no further than Instinct Raw Boost. This food includes actual freeze-dried bits of chicken mixed in with the kibble. I know my dog adores real meat in its original form, so I’ll probably feed this to her once she gets (much) older! It’s a little more expensive than other brands, but based on customer reviews, the price is worth the happiness of the dogs who enjoy this food. This shredded chicken recipe has everything your pup needs for a shiny coat, healthy joints, and easy digestion. It’s more affordable than other brands but still generally well-loved by customers and their older companions. Purina Pro Plan also carries a dog food tailored to pups with sensitive skin, if your older dog struggles with that. If you want to feed your pup the best of the best—which also happens to be pretty pricey—look to Dr. Harvey’s Canine Health Miracle Dog Food Base. It’s a blend of organic vegetables and and whole grains that you then add your own meat and oil to. 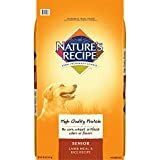 According to Amazon reviews, this is a lifesaving food for dogs suffering with kidney failure and other common age-related maladies. If your older dog is struggling, you might want to give Dr. Harvey’s a try. If your older dog is struggling with his weight, consider giving Earthborn Holistic Natural Food for Pet Weight Control a try. Formulated with all the joint-supporting, heart-healthy supplements your dog needs, this dog food is also low in calories. Popular brand Blue Buffalo offers up a meaty, protein-rich experience in its Blue Buffalo Wilderness Rocky Mountain Senior Dry Dog food (which also happens to be grain-free). Perfect for large breeds like German shepherds and huskies, this food will ensure that your older dog still gets to satisfy his big appetite. Based on the rave reviews on this product’s Amazon page, I might consider getting this one for my pup in the future. It’s affordable chicken-based food that’s got extra nutrients for your older dog, including everything he needs for healthy digestion and strong joints. But it won’t let your pup get too plump—Eukanuba’s special formula promotes a healthy metabolism to keep your dog slim and firm. If your older dog suffers from stomach issues, try Solid Gold’s specially formulated dog food. 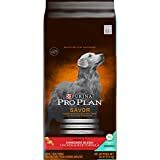 Amazon reviewers love this food, which seems to really have helped countless older dogs find joy in eating again. Before choosing a food for your older dog, discuss your particular pup’s health at your next vet appointment. Once you know what nutrients and supplements your vet recommends, check this list of excellent foods to find the one that meets your dog’s needs. Then go home, cuddle up with your well-fed senior dog, and rest in the knowledge that you can enjoy your dog’s twilight years while providing the best care and nutrition out there.